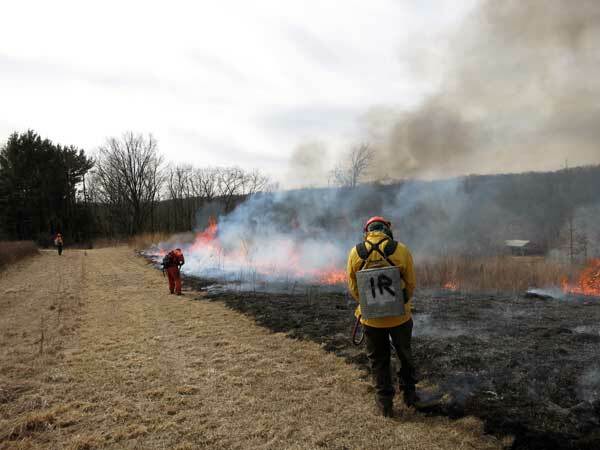 This season we have been doing prescribed burns in fairly cold weather. The dew points have been quite low, so that there was no dew on the grass even when the temperature dropped to the mid 20s (F). Leading up to each burn day we had several days of clear, sunny weather with temperatures reaching the upper 40s. But for the two successful prairie burns we did on Friday March 16, 2018 the temperature never got above 32 F! We burned the East Basin (5 acres, with complicated topography) and the Valley Prairie (4 acres adjacent to the PVC wetland). I had no success finding any information in the fire literature about burns in cold weather. Perhaps most people think you can’t burn when it is cold. 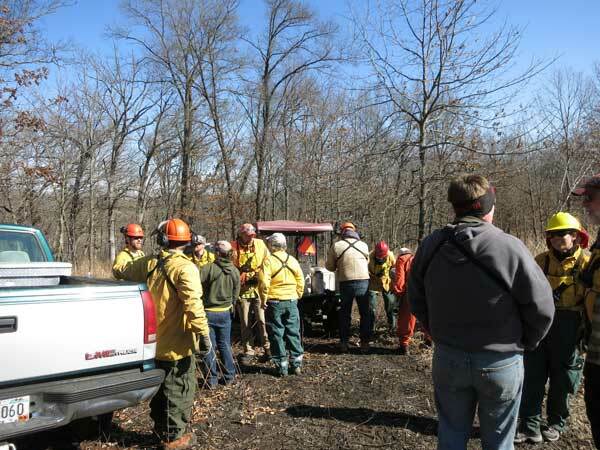 One of the most important parameters for a prescribed burn is dead fuel moisture content. This time of year prairie grass is fully cured, which means that its moisture content is completely controlled by external conditions, most importantly rainfall (or lack of it) and relative humidity (R.H.). Although temperature does have an effect on the rate at which moisture of the grass is taken up or lost, the most important influence of temperature on dead fuel moisture is the effect on R.H. When we burned Friday, the R.H. was below 50%. Although the fire literature has tables for estimating dead fuel moisture, these are only approximations and don’t take local conditions into consideration. But there is a simple way of estimating dead fuel moisture of oak leaves, which are a fairly good surrogate for grass. This is McCarthy’s test for assessing the moisture content of hardwood leaves by bending. Source: McCarthy, E.F. 1927. Weather and forest inflammability in the southern Appalachians. Monthly Weather Review, March 1927. Here is a guide to using the McCarthy test: When using the bend test, take several samples in both sunlight and shade and if on a slope, at the top, middle, and near the bottom of the unit. If the leaves have been wet from precipitation, wait at least one day of full sunshine with medium winds and RH below 50%. 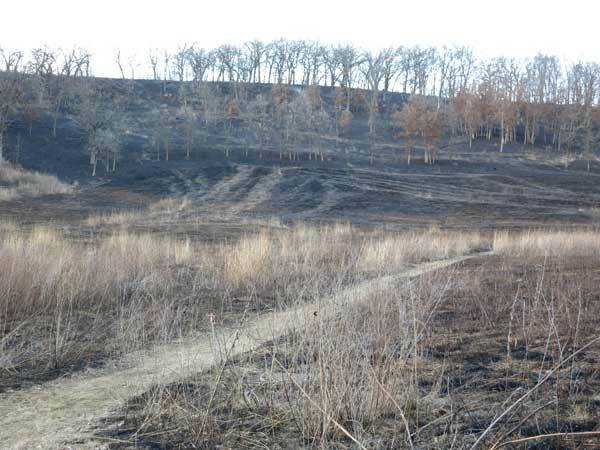 The photos show the fire behavior in the East Basin Prairie, a restored prairie. The fuel here, mainly Indian grass and little bluestem, was in its 8th growing season and obviously well established. According to NOAA weather radio, the early afternoon temperature was 32 or 33 F over all of southern Wisconsin. Almost complete burn coverage with just a few unburned patches. The white ash indicates complete combustion. The south fire line (facing north) still had piles of snow. Note also the snow on the distant hill. Final check of the burn. For information on the restoration history of the East Basin, see this link. 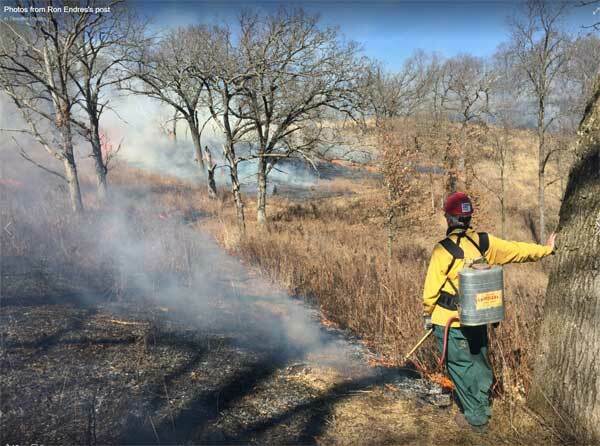 The Weather Bureau made no mention of it, but March 2-4 2018 provided unusually good weather for controlled burns, especially for oak savannas. This is quite a bit earlier than we usually do savanna burns, but one element of burn planning is to burn whenever the weather is right. Carrying out controlled burns of natural areas require lots of attention to detail. The crew assembling at the anchor point. The vehicles were parked on a black area from a previous burn. Each person had a two-way radio, essential on such a burn. We burned all the area shown in light tan on the map, 36 acres. Because of logistics, those units north of the motor vehicle road (Unit 19B,C,D, and E) were burned separately after lunch along with several units from a future planned burn (Toby’s Prairie, Annex, Triangle; see map); 6 acres. We call the units we burned the Basin Savanna, since they essentially wrap around the Pocket Prairie, which acts like a “basin”. The oaks in the upper part of the basin are burs and those lower down predominantly white, with some Hill’s oak and black oak intermixed. The location of the start of the burn, which was also our anchor point, was the junction on the map where 19E, 12B, and Toby’s Prairie come together. One crew moved west from there along the gravel road, backburning down through 11B and 11A until they reached Unit 18. 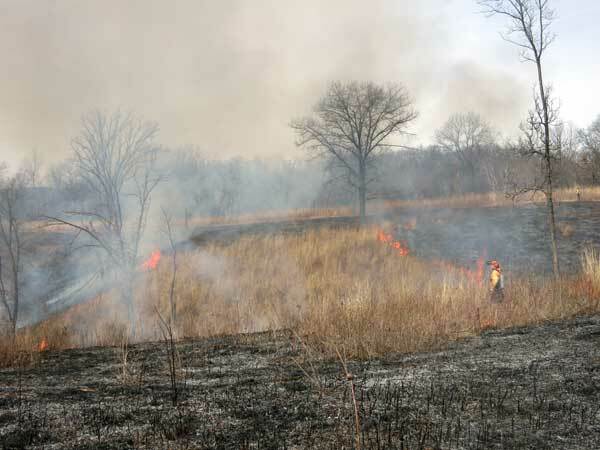 The other crew moved east, backburning through 12A and 20 until they reached the Pocket Prairie. Timing was critical and it was essential that the two crews coordinate. 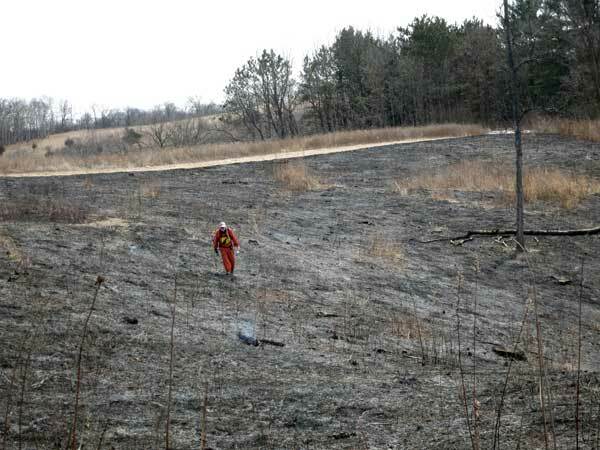 We did not want the 2nd crew to get too far ahead because once the 12A fire line reached the Pocket Prairie it would touch off a head fire in the prairie that could sweep up into 18 and 11D. Thus, the 1st crew had to get the 11A backburn finished first. Fortunately, every crew member had a two-way radio, so that coordination was good. Amanda, the burn boss, monitored the two crews carefully. The Basin Savanna burned very well, benefiting from the RH of 35-40% and a strong drying wind gusting from the south or east. We had twelve drip torches, and used every one! One of the important requirements of the savanna burn was to protect the lower branches on the large trees, especially those attractive “savanna oaks”. The way to do this was to avoid head fires in the savanna. Another goal was to protect as much as possible the living birches, since they are greatly used as wildlife habitat (woodpeckers, bluebirds). The litter at the bases of the birches had been removed with a leaf blower. Another goal was to protect snags (great wildlife habitat) by clearing the litter around them. Another reason for backburning is that it keeps the flame height low. However, because of the gusty wind, random change from backfire to headfire sometimes occurred. Although the wind helped to carry the fire in the savanna, it had potential danger for special trees, birches, snags. Tree-centered spot firing One procedure for protecting special trees, birches, and snags, was tree-centered spot firing. The drip torch operators had been instructed in how to use this technique. See my blog post for details. The savanna units back-burned well but gusts occasionally turned the fire into flank or head fire in some areas. Fortunately, these were relatively infrequent. A view across the Pocket Prairie to Unit 11D of the Basin Savanna. The oaks at the top are burs, those below are whites. The fire line moving down through the Basin Savanna eventually reached the Pocket Prairie, jumped the firebreak, and started the Pocket Prairie on fire. 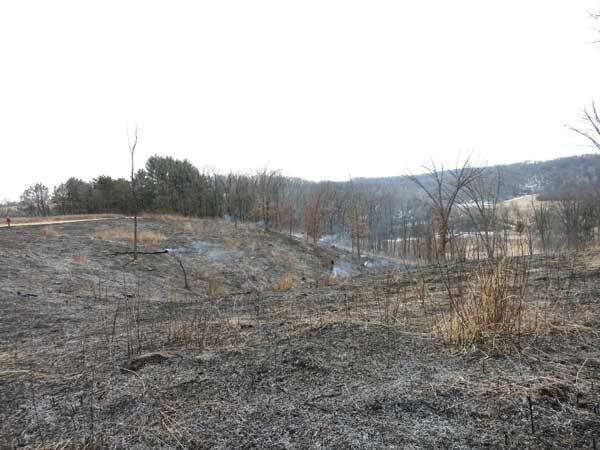 The Pocket Prairie mostly burned that way but was also lit from Pleasant Valley Road. Fire also started in the SW corner of the Pocket Prairie area by a spot fire from Unit 18. One of the goals was to get the fire into Unit 11A and Unit 18 before the Pocket Prairie caught on fire, because when the Pocket Prairie burned there was a possibility of it igniting Unit 18 from the bottom and hence turning Unit 18 burn into a head fire. 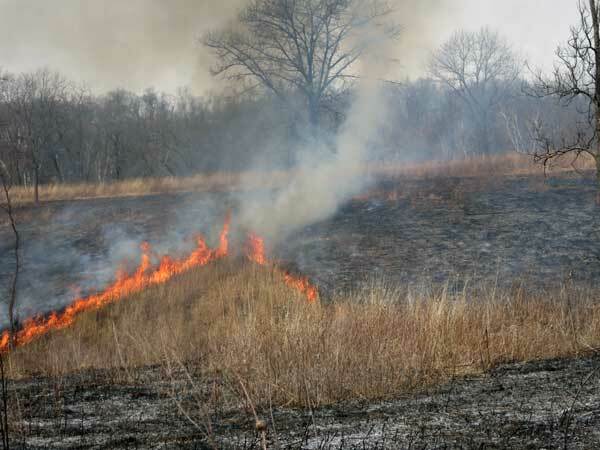 Note that with the lush fuel of the Pocket Prairie and the low RH, the Pocket Prairie burns very rapidly. It takes no more than 10 minutes for this whole 4.5 acre prairie to burn. However, this year there was an area of the Pocket Prairie which burned but the tall dead stems, mostly forbs, did not burn up. This area is in the outflow of storm water events from the ravine, in a wide line between the ravine and the outflow into the culvert under Pleasant Valley Road at the south end of the Pocket Prairie. This is an area that we had recognized as wet-mesic and had planted with species suitable for that sort of soil. The unburned area shows in one of the photos. Recap on the weather: Dry air mass came in Friday and held for weekend. Sunny. Dewpoint 21. Temp mid 30’s at night to low 50’s by noon. South wind around 10 mph. The sun was an important factor There were no clouds during night or day as well as for the two days leading up to the burn. Because of the low dewpoint, no dew on the grass or leaves. The wind was also important in helping the fire “carry” through the savanna. The temperature is not as critical as long as above 45. Nice comment from volunteer Ron Endres: Will and I were talking about how every single burn is different. Both the Tuesday and Sunday burns had fire behaviors we had never seen before. I think one reason we like being on these crews is that there is an element of "observe and then react" and often problem solving on the spot. There are very few "boring" fires. We also like burning with you [Amanda] and Craig and Chris. Even though you are the Burn Boss and Line Bosses, you draw on our experience. We always feel like we are needed. We work on a number of different crews and we don't always feel this way. And when the weather is like it was...it's a wonderful day.